It's another exciting week in SOCCSKSARGEN or SOX as the Department of Tourism-12 is holding the first-ever Tau SOX: Festival of First Peoples from October 26-30 to celebrate the National Indigenous Peoples Month and recognize the contributions of the different Indigenous Peoples' groups to the tourism industry in the region. Various activities will be held in different parts of the region for Tau SOX . These includes activities that will showcase Indigenous Peoples' traditional dances and rituals, cultural villages, traditional food, arts, sports and games, among others. 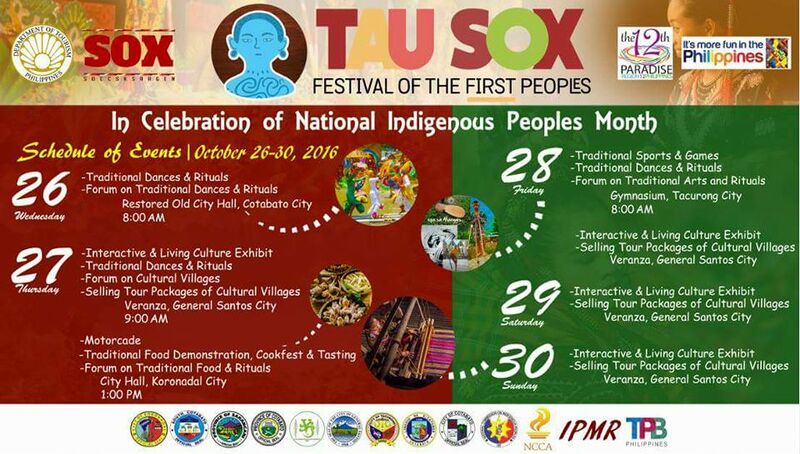 Highlight of Tau SOX is the exhibit of traditional houses at Veranza in General Santos City from October 27-30. To be featured are the "Gumne" of the Blaans, “Gono” of the Tbolis, the “Togan/Laminan” of the Maguindanaoans, and also traditional houses of the Tedurays and Manobos. Heritage identifiers including the Maitum jars, Kulaman burial jars, “Mabal Tabih,” works of the late Lang Dulay and many others will be also exhibited.